Reg Pearson conducted extensive research on the Edward and Dorothy line. The best available text description of this family line was prepared by Pearson, apparently in about 1977. Tim Halstead transcribed his descendant chart (and added some information of his own). That chart and Reg’s text report are provided below. Comparisons are also made of the three descendant charts, which appear to have been prepared independently. 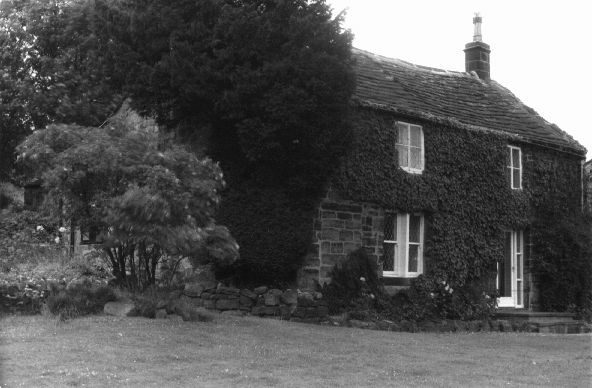 Another important source of information on Edward and Dorothy Grimshaw’s family origins and descendants is a website on the Quaker Meeting House at Rawdon prepared by Joanna Guise. This website is provided on a companionwebpage in a form that is slightly modified from Ms. Guise’s website. Thanks are expressed to Tim Halstead, who made his extensive research on the Edward and Dorothy Grimshaw line available for this webpage. Tim has also provided the family line description work by Reg Pearson available to the “Grimshaw research community.” Thanks also go to Hilary Tulloch for keying the Reg Pearson document into a word processor file. Gratitude is also expressed to Red Grimshaw for providing the family tree for the Joseph Grimshaw line. Finally, thanks to Joanna Guise for conducting excellent research on the Quaker Meeting House in Rawdon and making the results available on the internet. The following summary descendant chart is from Tim Halstead and “goes down” five generations, to persons born in the first half of the 1700s. A complete version of Tim’s descendant chart (excluding living persons) is given at the bottom of this webpage; it is, of course, much longer. The four “sublines” of Edward and Dorothy’s line are Abraham’s, Jeremiah’s, Josias’, and John’s (in bold.) Reg Pearsons description of the descendants of Edward and Dorytye Grimshaw, is given in the following section. 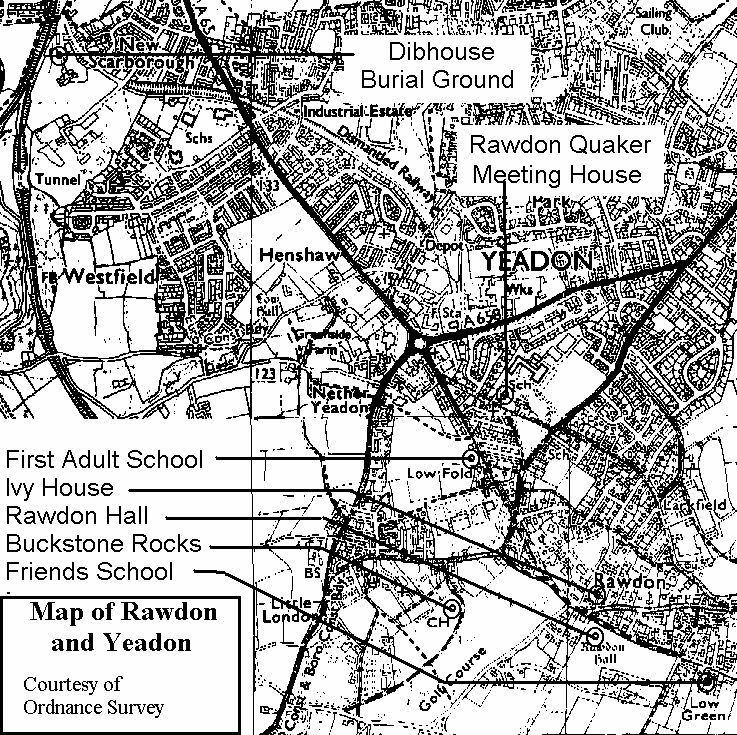 Note the close proximity of “Ivy House” and the “Rawdon Quaker Meeting House” – two important locations for Grimshaw family history on the map (Figure 2). The Meeting House and Ivy House are shown in Figure 3. 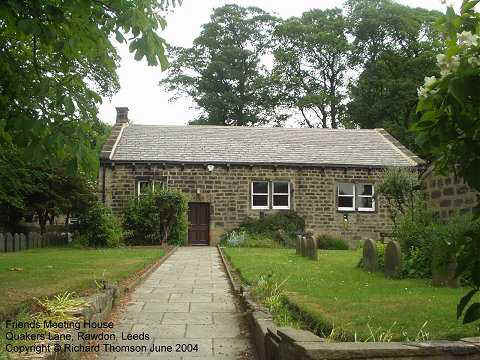 The source of the map and photos is Joanna Guise’s excellent website on the Quaker Meeting House at Rawdon (address shown below; also provided on a companionwebpage on this website). Figure 4 shows a recent photo of the Meeting House. Figure 2. Undated Ordnance Survey map showing important Grimshaw locations in Yeadon and Rawdon Area. Photograph of Ivy House taken in 1996 by Enid Sheldon with kind permission of the then owners Mr.& Mrs. Lawson (from Joanna Guise’s website). Recent maps from the Ordnance Survey website provide additional insight on the locatin of the Yeadon and Rawdon area (Figures 5 and 6). Figure 5. 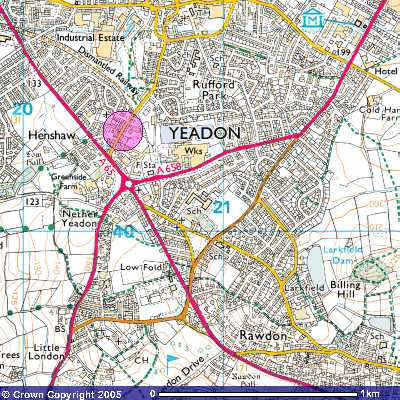 Map of Yeadon and Rawdon area with similar scale as Figure 2 above. The Meeting House location is near the center of the image – below and to the left of “Sch” near the number “21”. Ivy House, home of the Grimshaws, is below the “R” in “Rawdon”. The pink circle can be ignored as an artifact from finding the map on the Ordnance Survey website. Figure 6. 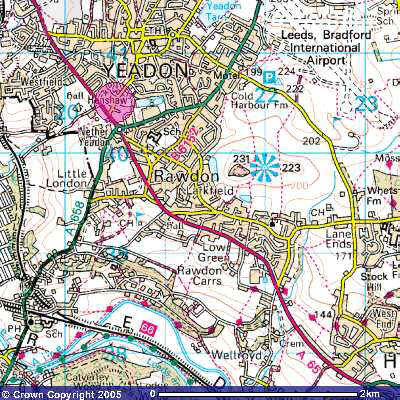 Smaller scale maps showing location of Yeadon and Rawdon area in relation to Leeds as well as the location of Yeadon near the intersection of the A658 and A65, with the Leeds, Bradford International Airport nearby. The only modification is the addition of the section headings (underlined), which have been added by the webpage author to improve readability and points of reference to the descendant chart. It is suggested that the reader reference the descendant chart in the preceding section while perusing the following text. Thanks are again extended to Tim Halstead for making the manuscript available and to Hilary Tulloch for keying it into a word processor document. A map showing the locations of Rawdon and Calverley, both referenced extensively in the text below, is given in the next section. GRIMSHAW is my Mothers name though in the 17th century the alternative of Grimshaw was used. The name Grimshaw comes from the old English word “Grima” a spectre and the word “Shaw” a wood or copse (place name elements by A.H. Smith). The earliest records I have been able to trace of our Grimshaw family come from the tiny village of Rawdon, which was a tiny village on the hill on the Northern side of the River Aire to the north of Bradford. Where does the name come from? There are three different suggestions re this. The first is “Raa” a wild goat and “den” a woody place or valley affording both food and shelter for cattle, whilst another version is Rawdon “the rough hill”. The third version Rawdon (Roes on the hill) derives its name from the number of Roes that in ancient times browsed on the hill. Rawdon was mentioned three times in the Domesday Book of 1085. At that time Rawdon along with Yeadon and Horsforth were surveyed as Terra Regis or lands belonging to the King. It is spelt in three different forms, Roudon, Rowdon and Rowden. A little later, a certain Robert De Bruis was stated to have held six ox gangs of land in Rawdon. This is supposed to be the ancestor of the celebrated deliverer of Scotland of the same name, Robert Bruce. Ox gang varied in size from 10 to 25 acres as it was as much as a yoke of oxen could plough in a season. Thus, if land was hilly or very stiff and bad to plough the oxgangs would hold less acres. Similarly the larger measurement of a carucate varied from 100 to 200 acres. In the 15th century the Manor of Rawdon was owned by the Rawdon family but passed out of its hands to Bolton Priory in 1529. At the Dissolution 1539, the Manor was bought from the Crown by the Earl of Cumberland. The latter sold the Manor to the Oglethorpes who in turn sold it to Francis Layton in 1916 [sic]. He had been Master of the Jewel House to Charles I and Charles II, but even before the Civil War in 1642 he seemed to be short of ready money and gradually disposed of most of his land at Rawdon and no longer had any Manorial rights. Turning back to the 16th century we find even then a growth of dissent against the Established Church. In Rawdon this began with the local Squires, when both the Oglethorpes of Rawdon and the Calverleys of Calverley were Catholic recusants. A recusant was one who refused to attend Church of England services and could be either Catholic or a Nonconformist. In 1559 the Rector of Guiseley, a Catholic, was deprived of his living. A year later in 1560 the Catholic Service Book was removed and replaced by the Book of Common Prayer. Some years later in 1581 the living of Guiseley was presented to Robert More a Puritan Vicar. Study groups were set up to teach religion, but, far from uniting his parishioners, it had the opposite effect and soon after the Grimshaw family of Rawdon left the Established Church. Edward Grimshaw the oldest ancestor I have been able to trace, was born some time in the 16th century and was married 17th August, 1602 to Dorytye Raner (Dorothy). A son Abraham was born soon afterwards, the actual baptism date being 5th July 1603. Edward himself in 1620 tenanted a messuage which in the same year was sold by Francis Rawdon to Abraham Bates of Yeadon. The Deed of 1620 was deposited at the Leeds Archeological Society among other documents of Miss Barwick of Rawdon, a member of the Marshall family. I think this messuage is Ivy House which still remains to this day, 1977, and was the original four room dwelling which was not enlarged until after the Civil War, 1659 in fact, the date on the sun dial. Edward Grimshaw himself was buried 22nd June 1635. His son Abraham was then aged 32 and we presume continued to live in the family home. I have been unable to trace his marriage but think this was probably not until about 1650 or later, his wifes name being Sarah. She was much younger than he was but I have not been able to find the district she came from. The eldest son, Abraham was probably born about 1651 or 1652. There were seven children in all, four boys and three girls, all born in the period 1651-64. Abrahams three brothers were baptised at Guiseley Church, namely Jeremiah 21st July, 1653, Josias 25th April, 1658 and John, who is my direct ancestor, 25th November, 1664. To put these dates in perspective one must remember that in 1649 Charles I was executed, whilst 1665 and 1666 saw the Great Plague and Fire of London. Their father Abraham died not long afterwards and was buried at Guiseley Parish Church 3rd March, 1670, probably the last connection of the Grimshaw family with the Established Church. Quakerism spread rapidly over England after 1652 and the movement gathered strength in many Radical Sects from among the working classes and returning Civil War veterans. To understand why the Quakers were persecuted, one has to look at what they said and the implications of their creed on the new and rather insecure Puritan Church if they carried out their intentions. They preached that “Light” should be experienced directly in meetings or fellowship, but whilst they refuted priests and doctrines, they demanded simplicity, truthfulness, brotherly affection, and equality before God. Power was not coveted by the Quakers, for they believed that this corrupted whoever held it. Looking at the Puritan Government, instead, they called out for spiritual commitment and social obligation. It was their principle that if exhortation failed then wrongs must be suffered. In 1669 no fewer than 14 monthly meetings had been established in Yorkshire, amongst them being Knaresborough, of which Rawdon afterwards became a subordinate meeting. Knaresborough included Rawdon, Knaresborough, Netherdale, Skipton, Asquith, Keighley and Farfield. The rise of the Clothier-Farmer class is the real phenomenom of the 17th century, the precursor of the industrial revolution. Abraham Grimshaw born 1603 died 1670 was such a clothier. His father had been a tenant of Sir Francis Rawdon and when the enclosures took place and the large fields divided into seven acre units, Abraham had sufficient title to claim a piece of land. Abraham, however, did not have enough money to pay for his holding, but as a good friend was prepared to buy the land for him, he became a tenant. First of all a house was built and, at Ivy House Rawdon, as the family and business grew, a cottage and barn were added as they could afford to build them. Later a staircase hall and front door were built between the house and the cottage probably in the late 16th century. After July 1664 when the Conventicle Act was passed by Parliament, the Rawdon dissenters were obliged to be discreet. The Act made it an offence, for any person over the age of sixteen, to attend a religious meeting where more than five or six persons were present, in addition to the family, and where the service did not conform to the liturgy of the Church of England. First and second offenders were punishable by fines, but for a third offence the penalty was £100 or seven years transportation to plantations in the American colonies. The Five Mile Act followed in 1669. This prevented ministers from teaching or even living within five miles of any town unless they swore never to attempt any alteration in government, church or state. This Act brought two famous Puritan Ministers into the social sphere of the Grimshaws of Ivy House, namely Rev. Samuel Cotes who died in 1684 and his friend Rev. Oliver Heywood. The latter was an Independent whose service was of Presbyterian form and his sermons were always welcome at Rawdon. By the time of Abraham Grimshaws death in 1670 the Grimshaws were convinced Quakers. Sarah, Abrahams wife taught her children not to raise their hats to the gentry, not because she intended them to be rude, but because she believed that the simple manners they used in the home, such as saying thee and thou to one another, were honourable and should not be used against them, as a sign of servility, by the better classes. Children could be baptised at home and marriages in neighbours parlours, but the business of death was of pressing and practical importance to the Rawdon dissenters. John Overend offered the dissenters a piece of his land at Esholt Springs for a burial ground. It was reached by the Pack Horse Road which passed Dib House Farm on its way to the fulling mill. It became known later as Quaker Wood and a lease of 1670 and a release of 1692 conveyed this to the Quakers. The second Conventicle Act of 1670, apart from the year of indulgences introduced by Charles II in 1672, saw the beginning of harsh persecution of the Quakers. It is estimated that twenty died under Cromwell whereas after the restoration three hundred died and at least 15,000 were fiercely persecuted. This year of indulgences 1672/73 showed by the large number of applicants for licences for preaching places, that the severe laws from 1662 had not been effective in securing conformity. Among the applications was one from Sarah Grimshaw for a meeting house at her home in the Parish of Guiseley. The denomination was described as independent and the preacher Josiah Collier 1594-1676. From this time until 1689 Sarah Grinshaw held Quaker meetings at Ivy House, meetings which at any time could have been broken up by intruders bearing powers of arrest. These meetings held amongst friends, in fact as well as in name, were warm and vital, for in no better circumstances can religion uplift men or fellowship aspire to spiritual communication with God. In 1680 in Rawdon the dissenters, as they were still called, split into Baptists and Quakers, most of the Grimshaws supporting the latter. Also in 1683 Jeremiah Grimshaw of Rawdon and others were indicted for being at a Conventicle (a Conventicle was a clandestine religious meeting especially of nonconformists or dissenters). The yearly tithes collection by the Parish Church was a bone of contention with the Quakers and to obtain the cash goods to the required value were distrained by the authorities. J. Besse Tithes taken in kind 1683 to 1690. In 1683 a determined effort was made to bring the dissenters to heel. William Rooke, Mayor of Leeds descended upon a meeting and committed eleven for trial whilst on 18th November a further 52 Leeds Friends were sent to York Castle and a contemporary account describes their suffering. The list appears in the Archbishops visitation court book (R.VIA.34) for 1684 and lists as recusants, Abraham, Edward and Jeremiah Grimshaw. They were summoned at the Quaker Sessions at Pontefract and fined two guineas, but not called for as yet according to the Book of Sufferings. The following is an extract from the Quarter Sessions Order Book Knaresborough 8th October, 1689. “The houses of the several persons hereunder written, all of them within the West Riding of Yorkshire be recorded for religious worship pursuant to the late Act of Parliament intitled a act for exempting Their Majesties Protestant subjects, dissenting from the Church of England from Sunday Penal Laws. Among the many names included were Sarah Grimshaw of Rawdon and Miles Oddy of Netherdale (the latter was the place where the wives of both Josias and John Grimshaw came from). In these days (1688) the roads were chiefly pack horse roads and were usually made of causey (causeway) stone. Those passing through Rawdon included i) by Dib House to Hawksworth ii) from Yeadon through Rawdon to Calverley Bridge whilst in later years there were the various turn pikes such as Leeds/Ilkley, Dudley Hill/Harrogate, and Yeadon/Bradford. Turning back again to Sarah Grimshaw, her husband Abraham died 3rd March 1670 leaving his wife a comparatively young woman with seven children aged from about twenty years down to six. Life would be difficult but the eldest son, Abraham, was a dominant character and on reaching his majority took over the main family home and small holding. Thus we find that in 1672 when the hated Hearth Tax was in force he was shown with two hearths, whilst his mother, Sarah, had one. The second son, Jeremiah, became a member of the Society of Friends in the same year, 1672, aged 19 and quickly became a minister. The Friends had no full time ministers in our sense of the word. A minister at that time was one who spoke in meetings; the recording of a minister in theory meant that his monthly meeting officially recorded the fact that Friends having for some time heard his offerings and believing him to be rightly engaged, encouraged him to continue in the service. Many of the early Friends, such as Jeremiah Grimshaw travelled in the ministry and local Meetings always appointed Friends to meet them and see them on their way to the next place  very necessary when there were no sign posts. John Grimshaw, the youngest son, also became a minister and when Jeremiah died in 1721 it was John who gave a testimony to his dead brother. Details of this testimony are given in “The Life and Correspondence of William and Alice Ellis of Ayrton” by James Backhouse, 1849. The following testimony to Jeremiah Grimshaw of Rawdon is from the pen of his brother John, who was also a minister. 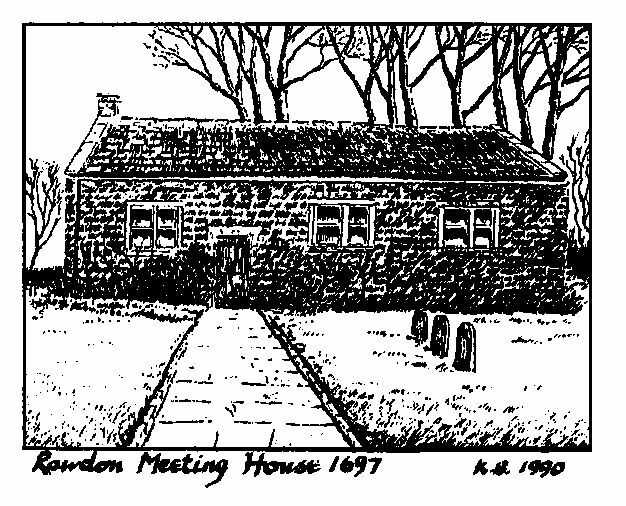 Rawdon Meeting House:- It is ordered that the new erected house in Rawdon be recorded. The business and concerns of ye preparatye Meeting was begun at ye Meeting House in Rawdon are here to be inserted beginning Anno 1700. The officials appointed to investigate the affairs of truth in this Meeting at Rawdon. Then follows the names of these four officials, one of these being Abraham Grimshaw (now of Calverley) and the eldest son of the Grimshaw family. I will just add two more quotations connected with our family. i) Preparation meeting at Rawdon 25th April 1701.
ii) Preparation meeting 29th February, 1702. At the back of the same Minute Book are lists of various procedures to be carried out by members. Abraham Grimshaw of Calverley Carr, Jeremiahs elder brother and one of the main members of the Rawdon Society of Friends was present at the opening ceremony of the new Rawdon Meeting House in 1697. Unfortunately ten years later, 6th December 1707 Abraham died and was buried at Idle. Normally it was necessary for younger sons such as my ancestor John Grimshaw, having served seven years apprenticeship, to find a house and the small capital to buy a hand loom, a spinning wheel, and tenter frame, the tools of the clothiers trade. One does not know whether John had set up on his own as a clothier in Rawdon or not but the death of his brother altered the situation. In his Will Abraham Grimshaw, after leaving various bequests to his children on reaching the age of twenty-one, left the remaining estate for life to his wife. However he appointed as Tutors and Guardians for his children, Jeremy, Josias and John his three brothers. Because of this John, the youngest brother moved to Calverley to take over the care of the family and also the small holding previously worked by Abraham. The house would probably contain one or two hand looms and this would enable John to start up on his own as a small clothier at Calverley. John had actually married his first wife, Grace Ibbitson in 1697. She lived at that time in one of a small cluster of four houses at the hamlet of Dearing, just to the west of Dacre in Nidderdale. Unfortunately Grace died soon afterwards and was buried at Quakers Ground 29th November 1700, her second new born child dying at the same time. Only a year or two later John married again, this time 3rd April, 1702 to Phebe Cockshaw of Yeadon. Two children were born from this second marriage before the move to Calverley. It was only natural for John to make this move as his elder brother Jeremiah was energetically engaged in travelling as a minister of the Society of Friends, whilst Josias, the second son was in charge of the family small holding at Rawdon. Immediately after the move to Calverley, a son, Jonathan was born, the latter being my direct ancestor. Evidence of John Grimshaw in 1721 exists in documents surviving of the Court Baron held by Armiger Sir Walter Calverley in that year (an Armiger is defined as an Esquire: – i.e. one entitled to bear Heraldic Arms). John Grimshaw lived in Calverley until his death, 29th June 1744, though returning each Sunday to the Friends Meeting House at Rawdon. About this time one of the Archbishops visited most of the Parishes around Rawdon as shown in the quotation below. Archbishop Herrings Visitation Returns 1743 app. “Rawden (Rawdon) 90 families in all. Of these, 12 families of ye people called Quakers. There is a Quaker Meeting which meets every Lords Day and sometimes oftener; one hundred attend. The teacher is called John Grimshaw. * * Appendix C.
He died 29th June 1744 aged 80 and was buried in the Friends Burial Ground at Rawden. He was zealously concerned for about 20 years to exhort Friends in a brief manner in their Meeting. Jonathan, John Grimshaws son followed his father as a small clothier and when 39 years old married Ellen Dale of Sowerby Park, Thirsk in 1747, three years after his fathers death. The word clothier had been defined in the Statute of Artificers and apprentices 1563 as a person who put to make and sale., i.e. he essentially bought the wool, saw to the production of the cloth and then sold it. The first child of the marriage of Jonathan and Ellen was also christened Jonathan and was born 17th June 1748. When the latter grew up, in Calverley, he married his wife Dorothy and set himself up as a farmer and cattle dealer. They had a large family of eleven children between 1778 and 1799, their eldest son John Grimshaw being born 16th February 1778. The Grimshaw family at that time were not official members of the Society of Friends but continued to attend the Meeting House in Quakers Lane, Rawdon and also recorded the births of the children in the Knaresborough monthly Meeting of which Rawdon formed a part. At this point I must say a little about Calverley, the village where my ancestors lived from 1707 for over two hundred years. Calverley itself was a pleasant village situated on high ground above the River Aire, six miles from Leeds and four miles from Bradford. There is a delightful walk through the woods and fields to Apperley Bridge, whilst the Church stands looking over the valley to a countryside of fields, woods and villages. There is some uncertainty over the derivator of the name Calverley. Some think that it may have come from Calfere the villages first Saxon Thane, while others think the name may be derived from calfherd i.e. Calverley:- A clearing or field used for calves or calf herds. Calverley is situated in the wapentake (i.e. hundred or division) of Morley, whilst it is also placed in the Honor of Pontefract within the manorial division of the vast possessions of the Norman de Lacy. St. Wilfrid, who is the patron saint of Calverley Church lived in the seventh century. It is said that the beauty of Wilfrid arrested the arm of the executioner, who had just beheaded at his side the Bishop of Lyons. He seemed to have had an eventful live, now being attacked by Sussex wreckers and later converting them to Christianity. The substantial grey tower of Calverley Church is conspicuous and the building itself is of interest in a lovely situation. It was probably built about the same time as Kirkstall Abbey, and it is believed to have been founded in 1154. The earliest building of which evidence now remains was a Norman Church similar in size and character to the famous church at Adel. There is a tradition in Calverley that Longfellows village blacksmith was inspired from this parish where one of his ancestors was the Vicar. The main family of the village also bore the name of Calverley. However, originally the family name was Scott; John Scott came south from Scotland many hundreds of years ago, in the entourage of Empress Maud, mother of Henry II and married the daughter of Alphonus Gospatrick, the then Lord of the Manor of Calverley. John Scotts son, John became Lord of the Manor of Calverley as his mothers male heir. Another member of the family called Walter Scott gave Calverley Church to the Archbishop of York, in the middle of the 12th century. In 1345 the Scott family changed its name to that of the village Calverley. A later member of the Calverley family was William Calverley, who died in 1596, and who was Lord of the Manor of Calverley, Pudsey and Burley-in-Wharfedale; an interesting link from earlier years between Calverley and Burley-in-Wharfedale, where my wife and I have lived since 1940. The Calverley family had its own tragedy. Towards the end of the 16th century, Walter Calverley, the son of William Calverley became engaged to a local girl, but when he went to London he met Phillippa Brook, whom he married in 1601 forgetting all the promises he had already made. Soon after his marriage he became given to habitual intoxication and debauchery. Walter and Phillippa had two sons, William and Walter. In 1604 they returned to the family home at the Old Manor House or Old Hall as it was later known in Calverley, where a third son, Henry was born. A year later, he was deeply involved in debt when he heard that his brother had been committed to prison in consequence of a security given on his behalf. This led to a crisis. Walter was unable to raise any money on his hereditary estates, which were settled on his eldest son, so frenzied by drink and possessed with an unjust jealousy of his wife, Walter Calverley went mad. When he saw his eldest son, the four year old at play in the gallery of the Old Manor House, he rushed upon him, inflicting two or three wounds with his dagger. He then rushed to his wifes room where his wife endeavoured to save the second child from his mad fury. Her efforts were in vain and the second child was also murdered. His madness was then directed against his wife on whom he inflicted several wounds. Fortunately these wounds were slight, the dagger having glanced off against a steel stomacher or whalebone bodice which she wore. In his mad rage Walter wanted to destroy all his children, whom he believed to have been born in disgrace and supposing his wife to be dead, he leapt onto horseback to ride to Morton (near Bingley) to kill his youngest son who was out at nurse there. He was pursued and as he together with his horse had fallen, he was captured and taken before the magistrates who committed him to York Castle on a charge of murder. Whilst Walter Calverley was awaiting his trial he became convinced of his wifes fidelity. Therefore, in order to save his property from forfeiture to the Crown, which would happen if he were to be found guilty, he refused to plead when arraigned. At that time the penalty for not pleading was “Peine forte et dure”. This meant that if a man would not plead, heavy stones were laid on his chest until he did plead or he died under their weight. It is said that, whilst under this agony, a faithful servant visited him. His master begged him to hasten his end, and he accordingly either added his own weight or that of further stones until his master died. The poor fellow thought he had helped his master, but the inexorable law of that time caught up with him and the servant was tried and executed for murdering his master. The child Henry, who survived, continued to live at the Old Hall until his death in 1661. The body of Walter Calverley, after his death at York, was supposed to have been removed back to the family vault in Calverley Church and there interred by candlelight. The play “A Yorkshire Tragedy”, which is based on the above story is included in the list of about twenty dramas which have been printed and sold under the name of William Shakespeare. The family of Calverley is also known as the family from which the prototype of Sir Roger De Coverley and the dance of that name came, Sir Roger being based on Sir Walter Calverley who was a friend of Addison. What else do we know of the Calverley family? On Good Friday, 1746 the Vicar and Church Wardens of Calverley Church agreed to a proposal that a proper person be appointed to keep the dogs out of the Church and to prevent, as far as he lawfully might, any disturbance at the time of Divine Service. Sir Walter Calverley offered to give enough cloth for a suit of clothing to this person, providing the Parish would provide a new coat every two years. In the Parish accounts for that period is “paid for a whip one shilling” (5p in present currency), evidently to be used against any stray dogs invading the Church. The records also show that a substantial stone bridge over the River Aire was built at Calverley Bridge in 1710 by Sir Walter Calverley in conjunction with Sir Walter Stanhope. Unfortunately, only about seventy years later on the 20th and 21st October 1775, following 36 hours of continuous rainfall, a tremendous flood occurred and this completely destroyed and swept away the bridge. It is stated that a hare escaped from the flood by floating down the river supported by the body of a drowned sheep. In 1749 Sir Walter Calverley died. His son, Walter Calverley had in 1728 or 1729 changed his name to Blackett on his marriage to a lady of considerable fortune who bore this name. In 1754 Sir Walter Blackett sold his Calverley and Bramley estates to the Thornhills of Fixby near Huddersfield for £62,000. This date of 1754 was important in the history of Calverley as since that date it has suffered from non-resident ownership. The sale of their ancestral estate by the Calverley family and its purchase by the Thornhill family who always lived elsewhere has helped to reduce the amount of information about this period. Thus the village of Calverley was mainly leasehold, the larger portion owned by the Thornhills with agents in Huddersfield. These agents were more criticised rather than praised as the owner if he wanted more money merely told his agent, who then notified tenants of an increase in rents. Another part of the village was owned by the Lamberts of Baildon. This part was largely one big farm but split into many scattered fields. Neither the Thornhills nor the Lamberts were sellers of land, but on the death of John Lambert who died intestate in 1824 portions of the estate were sold off. Few Manors have changed hands so seldom as that of Calverley. The rooms where the Calverley tragedy took place still remain; some years later in 1850 the Grimshaw family were living in some of the rooms of Calverley Old Hall. In 1801 Calverley was only a very small village with a population of 1127. An odd item in the records is that on 26th September 1826, a man was buried at Calverley Church in a coffin 7 feet 11 inches long. In 1841 there was no universal Suffrage but included in the list of voters at Calverley were William Gray, my great grandfather on the Pearson side, Samuel Gray his son, Benjamin Hall, my great grandfather on the Grimshaw side, Joseph Hall, his son and John Holgate, another of my great grandfathers on the Pearson side. There were no actual Pearson or Grimshaw names in the 1841 Calverley list of Voters. An interesting item of that time is that in 1841 a third of the men and half of the women were unable to write their own names. Returning to the actual Grimshaw family, you will remember the last date I mentioned was the birth of John Grimshaw, 16th February, 1778. John grew up at Calverley, and when aged 21 married Susannah Waterhouse who was born 11th March 1781 as shown in the Calverley Parish Church registers. I can find no record of their marriage at Calverley and it has been suggested that this may have taken place at Malham, though I have no evidence of this. From 1800 until 1822, they had eight children, five boys and three girls. From 1800 to 1814 John Grimshaw was described as a Worsted Manufacturer most of the time, but a little later in the records of the Society of Friends he was shown as a wool stapler (or sorter). In addition, John and Susannah were small farmers, their small holding being one of eight acres. David, my great great grandfather was born 24th July, 1813 and continued to live at the family home even after the death of his father John Grimshaw, 17th July, 1843. The name of John Grimshaw was in the Land Assessments Parish of Calverley and Farnsley (East Morley); in 1821 he was shown as renting a close or field from Thomas Thornhill, the sum assessed for tax being nine shillings. In 1832 he still held this land, the rental being £14/9/6 and the tax 8/7. In the next paragraph Mary Hall is mentioned. Her father, Benjamin Hall is also shown among the land tax payers. He rented a close at a rental of £12/1/-, tax 7/2 from the same Thomas Thornhill, whilst in addition he owned outright a small house and plot of land let to William Grimshaw who may or may not have been a relation. The rental was only 59 pence and the tax a mere two old pence was exonerated (i.e. excused). My great grandfather, David Grimshaw was a son of John Grimshaw, and David who was a clothier continued to live at the family home in Back Fold, Calverley even after his marriage to Mary Hall on 26th August, 1838 in Calverley. She was the daughter of Benjamin Hall, a cordwainer, of the same village. In those days there were no shoe manufacturers and the manufacture and repair of boots and shoes were carried out by individual craftsmen. The soft leather used, came from the town of Cordova in Northern Spain, hence the term cordwainer. The term shoemaker was not used until several years later. David and Mary had their first child, a son Frederick a year later on 27th August 1839, but within two years David was left a widower, Mary dying in 1841 after only three years of married life. I have already mentioned that Marys father was Benjamin Hall, cordwainer. In addition he also built quite a number of houses, most of these being in Hall Square, Calverley. These houses, twelve in number comprised two sides of a hollow square immediately behind 9 Well Terrace or 27 Carr Road where my grandfather and grandmother lived when they came back to Calverley from Lightcliffe in 1882. Benjamin Hall died on 1st October 1844, and in his will he distributed the houses among his children. An interesting thing was that he left two houses to my grandfather Frederick Grimshaw, who was only a boy aged five at that time. I think these two houses may have been at the address stated above. The majority of houses in the Square are of three storeys and I was told by the Vicar of Calverley that the upper storeys of the houses were inter-connected and used by the inhabitants for weaving on their hand looms. Benjamin Halls Will mentions rights regarding a well which suggests there was quite an important well in the vicinity of Hall Square. This may explain the derivation of the name Well Terrace. and in 1851 the census shows them living at the Old Hall Calverley, Susan being a widow of seventy, farmer of eight acres, and David, her son a widower aged 37, cloth weaver. Also mentioned were the three grandchildren, one Frederick, mentioned above, aged eleven, John aged three and Elizabeth Exley, aged twenty four. This is the first mention of the two latter persons. It appears that Edmund Grimshaw, David Grimshaws younger brother married Martha Susannah Riley on 5th October, 1842. Some years later his wife died leaving three small children and Edmunds mother Susannah offered to look after the youngest child. Previous to this David Grimshaws eldest sister Susannah married a man called Exley. Both he and his wife died in approximately 1840/41 leaving two small children. The elder was Elizabeth Exley and in 1851 was at the Old Hall as a servant, evidently helping with the bringing up of Frederick and John. The Hall family continued as cordwainers and in 1851, though Benjamin had died, his two sons, Joseph and William carried on two separate businesses as cordwainers. In addition William Hall had a small farm of 12½ acres employing one labourer. It is interesting to note that this same William Hall was married to Frances Pearson, who was the sister of my great grandfather Henry Pearson. Their son James continued to follow his fathers business as cordwainer. In 1861 the Grimshaw family were still at the Old Hall, Susannah now an old lady of eighty still looked after her eight acres, whilst her son David and grandsons Frederick and John were woollen cloth weavers. It may help to give you some indication of conditions and happenings in those days if I mention that on 10th March 1863, the Prince of Wales was married, and to celebrate this, a sheep was roasted whole in Clover Greaves Mill yard, Calverley. The cost of the sheep was raised by subscription and afterwards distributed to all the children who attended the cutting up of the same. First of all each child was given a sop, an oatcake that had been dipped in the hot fat used in roasting and then the roasted sheep was cut up into small pieces and distributed. Manuring of gardens in the middle 19th century was a problem, as there were relatively few fertilisers. Soot and lime were used but most of all farmyard manure. Much later, in the early twentieth century, when motor cars were a rarity, animal manure on the road was abundant and well worth collecting. Thus in 1911-13, when I was aged 6 to 8, I lived at Airedale House, Bramley. I well remember using a small wooden box on wheels to collect the manure on the lane leading down to the mill, and delivering it to an Aunt who was the wife of the Mill Engineer and lived in the millyard. On Christmas Eve, 1862, my grandfather Frederick Grimshaw married Emma Grange, daughter of Abraham Grange, Woollen Manufacturer. After their marriage, Frederick Grimshaw and his wife, Emma appear to have stayed in Calverley for the next three years, having two daughters, Mary who died in infancy, and Edith, born 12th January, 1866. About that time Frederick decided to leave his native village and take up a position as a manservant in the hamlet of Lightcliffe on the Leeds side of Halifax. Two further daughters were born in 1867, but in 1873 Fredericks wife Emma was taken seriously ill and died 13th April, 1873. The two younger children had not been christened at birth and Emma, realising how ill she was asked for a christening to be arranged and this took place on the actual day of her death. Frederick was left with three small children aged seven, six and three. Within five months he married again, this time to my grandmother, Mary Ann Butler, who is believed to have been a governess at Bronte House, Apperley Bridge. I am uncertain how they met as her family came from Darleston in Staffordshire. Her parents were James Butler and Selena (nee Wilkes). He, along with his brother were Gunsmiths and Locksmiths in Darleston. It is probably that after a family disagreement, he left the Midlands in about 1864 and came to Leeds with his wife and seven children. There he set up a small business as a Nut and Bolt manufacturer which he carried on until his death in about 1875. Frederick Grimshaw and his second wife, Mary Ann continued to live at Lightcliffe near Halifax where my mother was born on 15th November 1874. It seems unusual that she should be called Emma, as that was the name of Fredericks first wife. By this time, 1874, Frederick had become a butler and continued to live at Lightcliffe where three further children were born in quick succession. During this time he was a keen horse rider, being very slight in build, and I think it was about this time 1878/82, that he had a fall at Bingley Show and walked with a limp ever afterwards. In 1882 his Uncle William Grimshaw, who had a tiny grocers business in Calverley, died and Frederick moved to 9 Well Terrace or 27 Carr Road, Calverley with his wife and eight or nine children. The small grocers business was carried on by Mary Ann Grimshaw and her daughter, Bertha Amelia, for many years, long after Fredericks death on 7th May, 1911. Frederick Grimshaw and his wife and daughters were a Church of England family and though the latter seldom tended to mix with the Methodists, my mother, Emma Grimshaw, and my father, Philip Henry Pearson met and were married on August 5th, 1899 at the Primitive Methodist Chapel, Calverley, the honeymoon being spent at Laxey in the Isle of Man. Yeadon, Rawdon and Calverley, the places where the Edward and Dorothy Grimshaw family line originated, are located about 5 miles northwest of Leeds as shown in Figure 4 below. As a side note, Haworth, where William Grimshaw served as rector and gained a significant reputation as an evangelist in the first half of the 1700s, is located near the west edge of the map, just southwest of Keighley. William was a comrade-in-arms of the Wesley brothers during the formative years of Methodism, and is the subject of a companion webpage on this website. Joseph Grimshaws family line is described on a companionwebpage. Joseph was married in England and started a family there with Margaret Wetherold. Apparently after his wife died, Joseph emigrated to America, remarried (to Elizabeth Jane Booth Mitchell-Hadden) and started a second family. At least some of the children from the first family came to America to join the second family. A summary family line for Joseph, prepared by an unknown author and (apparently) independently of Reg Pearson, is shown below. Joseph is descended from Josias’ subline. Note also that the four brothers (Abraham, Jeremiah, Josias and John) are shown as having three sisters (Marie, Sarah, and Rebecca) that are not shown in Tim Halstead’s descendant chart. The original record from which the above descendant chart was derived indicates that Joseph and all his siblings, his parents and aunts and uncles, and all other Grimshaws in the line going back to Edward were born in Rawdon. Jonathan and Eliza Maria (Topham) Grimshaw were married in England in 1841, joined the Mormon church in 1849 and emigrated to America with their family in 1851. The journey to America was chronicled by Jonathan and was subsequently privately published3, along with family line information, which is shown in the summary descendant chart shown below. A companion webpage for Jonathan and Eliza has been prepared. |–|–|–Emma Grimshaw (24 Aug 1843 – ) & John Peter Fromme Jr.
Jonathan’s line is in the Jeremiah “subline” of the Edward and Dorothy Grimshaw line, as shown in Tim Halstead’s full descendant chart at the bottom of this webpage. Jonathan was born in Yeadon, which is less than a mile from Rawdon, the location of Edward and Dorothy and many of their descendants. My father’s name was John Grimshaw. He was a younger son of a man belonging to a class called in England “gentlemen farmers,” and was born in 1800 near Leids (sic) in the West Riding of Yorkshire. He came to N.Y. at an early age and became clerk for Jeremiah Thompson of that city. Shortly after coming of age he went into business for himself & engaged in cotton speculations so successfully that he soon acquired what was for those days a fortune. He built the house above named and married in the year 1825. Of course having made a fortune so easily he could not discontinue his speculations & (equally of course) before the year 1830 he became bankrupt & had to surrender all his property to his creditors. My mother’s maiden name was Emma Robinson. She is the daughter of Wm. T. Robinson of the mercantile firm of Franklin, Robinson & Co. well known to New Yorkers of the latter part of the last century & was born Sept. 9th, 1803. One of her sisters married Jonas Minturn of N.Y.; another, John B. Toulmin of Mobile (Ala); another became the wife of Wm. Hunter, U.S. Senator from Rhode Island & minister to Brazil in President Jackson’s administration. My mother is now living in N.Y. City. In the year 1830 my father sailed for Liverpool in the ship Mary & Harriet. After remaining in that place a little more than a year he returned to N.Y. in the Ship Sarah Sheaf. I well remember living in the suburbs of Brooklyn, in the cholera season of 1832. About 1833 we again went to Liverpool in the ship Great Britain, Captain French; where my father went into business as a ship broker & where he remained until the latter part of 1837 when we sailed for Mobile (Ala) in the ship Plymouth of Boston, Captain Kenrick. Although John is not referenced directly in any of the three descendant charts on this webpage, he is probably descended from the Edward and Dorothy Grimshaw line, as indicated by, first, his origins “near Leids (sic) in the West Riding of Yorkshire” and, second, by his first name, John, which (with Jonathan) was the most commonly used name in Edward and Dorothys family line. A more complete version of Tim’s chart than that presented in the first section above is given below. It contains more than 70 individuals in four “sublines” — Abraham, Jeremiah, Josias and John, grandsons of Edward and Dorothy. As noted above, there were apparently also three sisters (Marie, Sarah and Rebecca) who are not included in Tim’s records. Living individuals have been removed from Tim’s complete file. Sharon Wilbur, a researcher of the Edward and Dorothy Raner Grimshaw line in Yorkshire (see companion webpage), has conducted extensive and very well documented research of the descendants of John and Pheby (Cockshaw) Grimshaw’ sub-line. The results of Sharon’s research are shown on a companion webpage, including a detailed descendant report that includes nearly 1000 citations, many of them microfilms from the LDS Family History Center in Salt Lake city. The Grimshaw descendants of this line are indeed fortunate to be the beneficiaries of Sharon’s extensive and professional research. Sharon has consented to provide her e-mail address for Grimshaw researchers who may have questions on her webpage: wilburfamily@mstar2.net. A couple of contributors have provided additional information on certain segments of Edward and Dorothy’s line of descendants. Their contributions are summarized below. Great to hear from the people who are interested in the Grimshaw line. The name ends at my GGrandmother and most of the information I have has been scrounged from others, or is from the 1841 to 1901 census info to which I have access. You are welcome to use any of the info which I have although it is not thoroughly checked out. Recent generations are courtesy of family members, supported where possible and I can vouch for the last 3 or 4 generations personally. A kind person supplied a family tree for Florence 1892-1986 which ran up to date and gave me the ancestry back to Edward and Dorothy Raner through all the Abrahams. This is how I discovered the site with the history on it. I have used both these sets of info to update my tree without checking sources. I attach a Gedcom file of my current tree for your info. Please use it to further your investigations with the caveat that much is unchecked. I believe it is substantially correct. |—|—|—|—|—|—|—|—|—|—Edwin Burnell* & Moira ? 1Pearson, Ernest Reginald, date unknown (probably 1970s), The Ancestors of Earnest Reginald Pearson  Grimshaw 1600-1900 (and) Pearson 1760-1960: unpublished manuscript, unk p.
3Grimshaw, Jonathan, date unknown, The Journal of Jonathan Grimshaw: unpublished book, 19 + 5 p.
4Kantor, J.R.K., 1964, Grimshaws Narrative, Being the Story of Life and Events in California during Flush Times, Particularly the Years 1848-50, Including a Biographical Sketch, Written for the Bancroft Library in 1872 by William Robinson Grimshaw: Sacramento, CA, Sacramento Book Collectors Club, 59 p.
Webpage posted December 2000. Updated April 2005 with addition of section on Sharon Wilbur’s research. Updated October 2005 with addition of material from Joanna Guise’s website on the Meeting House at Rawdon. Updated January 2007 with addition of Beverly Yewdall and Dave Hargreaves information on two sublines.